Yolande Brener pulls back the curtain on life inside the notorious Moonies, and describes marriage to a stranger in a 30,000 couples mass wedding. Yolande has worked as an actress, filmmaker and disciple of an alleged Messiah. She has written for New York Press, nerve.com, Harlem World, the Beyond Belief anthology, British Film Institute and Channel 4 television in England. What is the purpose of life? Does true love exist? If there is a God, why does he let the innocent suffer? A business card with these questions led Yolande to the cult, and to the fifteen-year odyssey that followed. Read a preview of Holy Candy on Amazon. Read an interview with Yolande Brener on the Beyond Belief website. 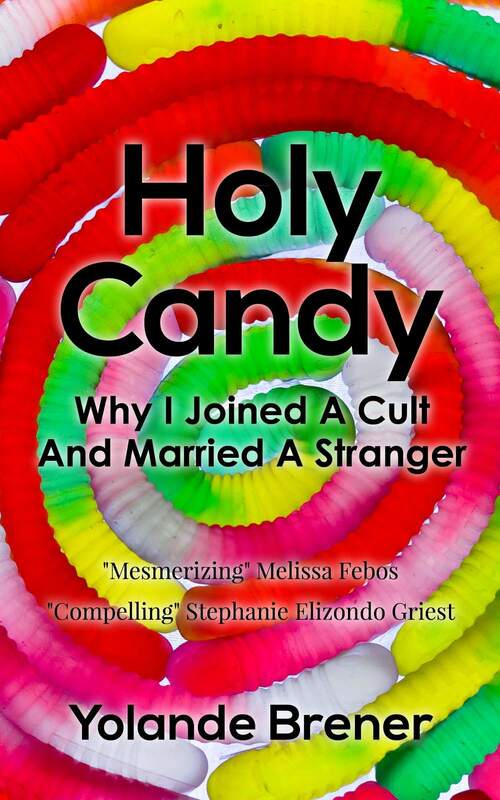 Read about Holy Candy in Harlem World, howwelldoyouknowyourmoon and Beyond Belief. Watch an interview with Yolande Brener and John Seigenthaler on Al Jazeera America. Hear Yolande read from Holy Candy on the Danny Tisdale Show. More information about the author is available on Yolande Brener’s website.